The EASIEST, EASIEST, EASIEST way to sew squares! Cut squares 2", they will finish at 1.5". Each panel has (162) squares. Nine (9) squares across by eighteen (18) squares down. There are extended lines, so that you can use more squares if you want to "work" your project a column or two wider. General instructions for sewing come with the pack. METHOD: "Fuse, Fold, & Sew". 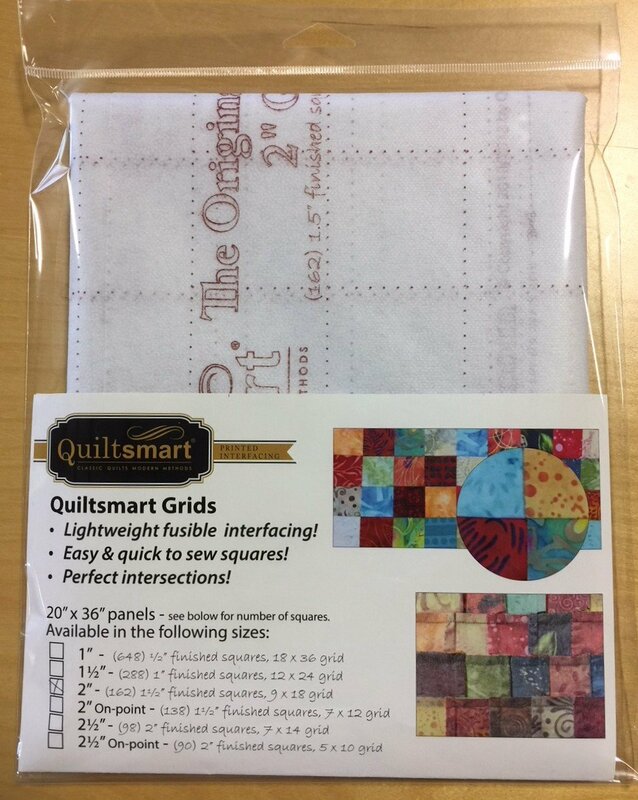 Perfectly-matched seams, easy construction, using Quiltsmart grid interfacing technique. WAIT, WAIT - did we say you also get PERFECT MATCHING??? Without even trying, it just happens. You will love it! You really will. Okay, nuff said. Comes in a 9" x 11" pack with interfacing & instructions. TIP: We wanted to give you the most for your money, so we added extra lines under the information printed at the top and bottom of the panel. Light fabric squares are not recommended for placement in those squares IF the print shows through them, but those squares are very usable. If you do use a light square in those areas, there are two things you can do if the print shows through - line the light square with another piece of interfacing or fabric , or peel the interfacing away after project is completed in those areas, but you would not want to do this for all squares, as it would be time consuming.